Several folks have asked about the spoons metaphor. This comes from "spoon theory", promoted by the lupus and MS and other communities of people with "hidden disabilities". Basically, the idea is when you're sick that way (or in my case, in post-op recovery followed by chemo), you can still do anything you want. You just can't do everything you want. People in full health start their day with a very large supply of spoons, the spoons representing increments of energy or attention or focus, and spend them as they go through their days. People in limited health have fewer spoons. Simple things like taking a shower can take a lot out of a person, for example. So you wind up asking yourself questions like, "do I have enough energy to take a shower and to do a load of laundry?" Because you have enough spoons to do either but not both. 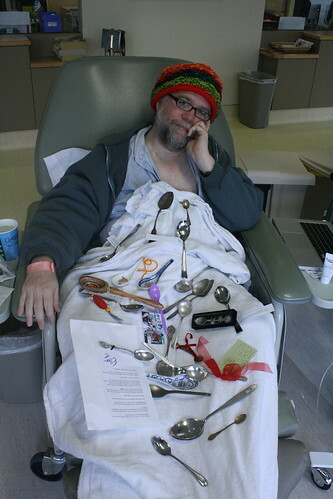 Chemotherapy definitely places me in spoon deficit. I don't look like I have cancer. My face isn't drawn, I don't move in pain, I am my usual ruddy color. It's easy to look at me and wonder why I'm walking so slowly, for example. But the spoons are still missing. So my friends and loved ones have conspired to shower me with spoons. That way I have extras, to move me through the hard times ahead. And once again, thank you all. 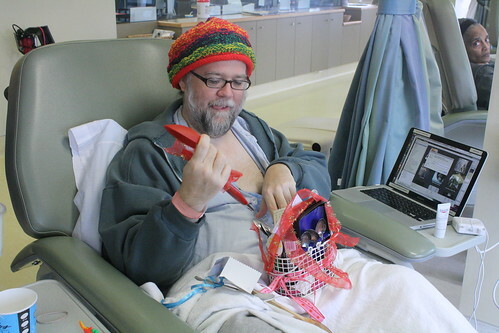 Later I'll see if I can pull together a more complete assessment of the spoon gifting, and proper gratitude by name. Oh there is one very fine Titanium "Battle Spork" provided by the lovely and talented jennifer_brozek. *g* It made me laugh so hard I had to share. Thank you for posting this. I shared it with a friend who is undergoing chemo for breast cancer and she is very young and needs support. This was a helpful post. Is the very first one, from before my initial diagnosis. I've been pretty blunt about it all, the good and the bad. Or she can write to me if she likes, either through comments or directly.